This is Daniel Sovelius, a custodian for the U’s Department of Mathematics, as told in part by his brothers Paul and Brace and his coworker Della Rae Riker. Daniel came to the U thanks to an enlightened University of Utah guideline aimed at supporting work opportunities for special-needs individuals. And Daniel continues to prove them wrong as he recently celebrated 30 years of working at the university—10 years more than his brother Brace. “I just love working . . . custodian work,” Daniel said. “Sometimes I shake hands with people or bump knuckles or elbows,” Daniel said, rattling off names of people he interacts with daily. Daniel takes UTA to-and-from work and enjoys riding as far south as Payson and up to Brigham City. 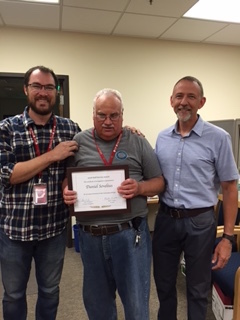 This past spring, Daniel received special recognition from the Department of Mathematics for his three decades of service, which presented him with a certificate signed by his supervisor and President Ruth V. Watkins.